Energy storage is going to be a huge industry in the transition to renewables, and European countries and producers are moving in on batteries. 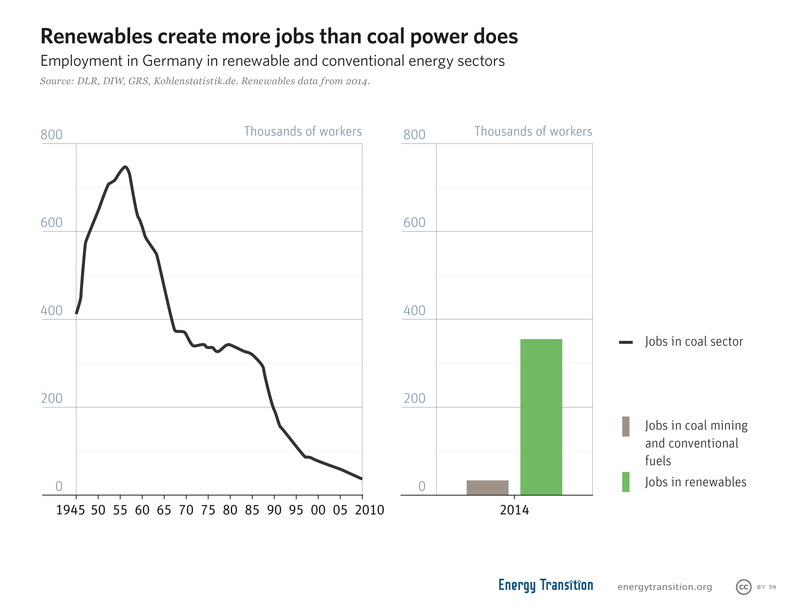 This is Germany’s chance to bring stable jobs to its former mining regions, and finally phase out coal. L. Michael Buchsbaum takes a look. This June, Europe’s largest battery came online: a whopping 50MWh in Jarelund, Germany. Built by NEC ES, the “EnspireMe” battery is a joint venture between the Dutch renewables company Eneco and Mitsubishi Corporation. It’s connected to regional wind farms and allows power stored in the batteries to either be sold into Germany’s reserve markets where it provides balancing and grid stabilization, or directly into the grid where it can compete against coal and gas. Comprised of 10,000 lithium-ion batteries, the project further demonstrates “the economic benefits of pairing energy storage with renewables, first proven with solar and now with the abundant wind generators in the Jardelund region,” said NEC ES CEO Steve Fludder at the commissioning. While Tesla’s 100MWh battery in Australia remains the world’s largest, giant battery projects are being announced daily—especially as more renewables come online. Ever-larger storage systems are key for balancing out wind and solar energy arrays. Their growing role in the energy mix reinforces the call for the development of a European-built next-generation battery industry. Envisioned as a win-win situation, in October the European Commission established the European Battery Alliance (EBA). The alliance should encourage investors and companies to help power a nascent electric car industry, supply the evolving energy grid and generate thousands of high paying, high-tech jobs. Now several companies, including Tesla, are reportedly taking steps to construct vast so-called “gigafactories” throughout the continent. And ahead of its first meeting, Germany’s new Coal Commission (tasked with phasing out coal while helping affected workers) cited green-battery factories as a viable solution to replacing jobs and revenue as fossil fuels are eliminated. At June’s Intersolar conference in Munich, Maroš Šefčovič (EC vice president for energy) spoke passionately about establishing a European-wide, battery-centered private-public partnership, similar to the way aircraft manufacturer Airbus was created. He called for the European Commission to hammer out regulatory schemes and develop standardization protocols to help member states lure battery producers and investors, and sweetened the offer by vowing to step up EU research and innovation “to better link it with industry’s future needs.” Immediately available through 2019 are €110 million for battery-related research and innovation projects. And from now through 2020, developers can tap into “a budget of €2.7 billion available under the European Innovation Council for potential breakthrough projects and batteries,” he said. While the EC’s Renewable Energy Directive played a key role in persuading EU member states to install the more than 100GW of Photovoltaic (PV) capacity now generating energy today, Šefčovič lamented that Europe failed to create enough support for manufacturing across the whole value chain. Commenting on European PV makers’ general loss of market share “to our competitors,” he’s determined not to make the same mistake with batteries. “We want to be a global trendsetter. This should cover the entire value chain from the sustainable supply of raw materials, through production to recycling. This and next year, we will be in close contact with the European standardization bodies in order to develop European standards – the green label,” Šefčovič said. Another potential developer, consortium TerraE, is purportedly planning to launch battery production in 2019 and have two plants with a total capacity of 34 gigawatts running by 2028. The Swedish startup, Northvolt, led by former Tesla executive Peter Carlsson, aims to produce batteries with 32 gigawatt-hour capacity by 2023. It has already attracted a €10 million investment from VW’s truck subsidiary Scania, and just received approval from the European Investment Bank (EIB) for a €52.5 million loan for a demonstration battery production plant. Plans call for the construction of a gigafactory in northern Sweden with companies like Vattenfall, ABB and Siemens having a presence there too. If these plans succeed, Europe could become the hub of battery production, creating jobs and a better life for those in regions left behind by the shift away from coal. Ahead of Germany’s Coal Commission’s first meeting, word leaked that they too are focusing on luring battery producers to coal dependent areas where some 100,000 or more jobs hang in the balance. Former mine sites, as well as nuclear and coal-fired power plants, are inherently suitable for redevelopment as gigafactories: they are already electrical grid and transportation hub and have a population eager for stable jobs. Supporting the growth of green e-battery “gigaproduction” centers could provide an elegant, high-tech solution for Germany and Europe, as well as a model for others worldwide. The difference is that Europe had a pv module industry and lost it. Batteries have grown to scale in Asia. Look at the leading companies: BYD, CATL – China; LG and Samsung – Korea; Panasonic – Japan. They will still build battery factories in Europe assuming its carmakers survive, but talk of regaining leadership is wishful thinking. One thing never discussed by Sefcovic & co is money. One of the (key?) factors in the rise of the Chinese PV (& batt) companies is access to money – low cost money – specifically Bank of China low cost money (& remember – China is NOT classified as a market economy by the EU). Politicos such as Sefcovic could make low cost money (via the ECBundesbank – so called cos it is controlled by the Bundesbank) available to various EU sectors. That they have not demonstrates a combo of cluelessness/stupidity coupled to ideology (let markets decide). I hope the Euro batt industry does well – however, it is competing with one hand tied behind its back – cos the Chinese have access to very low cost capital (0.5%) whilst the Euro bunch – due to neo-con ideology – don’t. I fear a repeat of the PV saga – with the usual hand wringing by the usual morons.